Goddess Kushmanda is worshipped on the fourth day of Navratri. She is worshipped on October 13, 2018 during Navratri. The day also marks the beginning of worshipping of Goddess Lakshmi during Navratri. Legend has it that Lord Vishnu was able to begin the creation of universe, when Goddess Kushmanda smiled and receded. She represents that form of Durga, which is the source of all. Goddess Durga is also worshipped as Bhuvneshwari on the fourth day in many parts of India. Goddess Kushmanda is also depicted as having four hands. 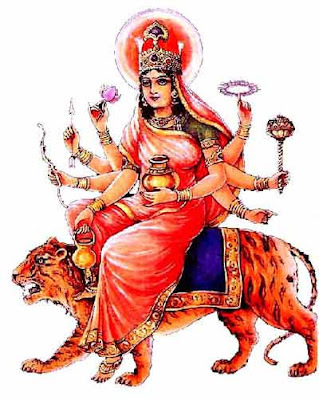 She is also known as ‘Ashtabhuja,’when she is depicted as having eight arms. When she is eight-armed her one hand rests on her stomach holding a pitcher (symbolism of universe in her stomach), the other hands hold chakra, gada, rosary, lotus flower, arrow, bow and water pot. She rides on a female lion. Legend has it that Goddess Durga gives birth to the universe in the form of Maa Kushmanda. She is also sometimes depicted as pregnant with the Brahmand or universe. It is believed that the eternal darkness ended when she smiled. And this led to the beginning of creation. This form symbolizes that Shakti is the primordial source. She blesses a devotee with various siddhis. She also helps in finding relief to life threatening diseases. She removes all kinds of unhappiness and worries. She blesses her children with longlife. She provides name and fame to her devotees. The important offerings to her are rose flower and the sweet called malpua.